But now, as the final countdown to life as I know it ticks by, I have continued to practice what I preach, and document my happily growing belly! I will be honest… I wasn’t sure I was going to do a maternity photo shoot (even though they are among my favorites to capture), and I wasn’t sure I would like seeing them. WRONG! I am so glad that I let myself be vulnerable and stepped in front of Gabriella’s camera to capture this very monumental stage of my life. I mean, I’ve waited 36 years for this, so it’s time to celebrate! I see the belly I spend all day rubbing and thinking about… I can see the absolute excitement and joy in my eyes at what this new phase of my life brings… I did see the sheer exhaustion too, but we took care of that in the editing process (teehee). I gave Gabriella carte-blanch to do whatever she wanted during this shoot. I was determined to not be a backseat photographer. I love her creativity, her ability to set me at ease (I mean, my co-worker is now seeing a whole lot of me! ), and most of all how she captured me in such a flattering way. I am so relieved, grateful & so glad to have done this photo shoot… especially because I can now refer to my own experience when speaking with clients. My plans for the photos? I am going to be putting them in a spectacular linen album that ties shut with a ribbon… an elegant, but private keepsake. I’ll be sure to photograph the final product to show you how it looks! So here are a few of my favorites from my pregnancy photo session… 20 days and counting until it’s the babies’ turn to be in front of the camera.. stay tuned! Pregnancy is such a beautiful time, and you often hear about the glow the mom’s-to-be emit during this transformative time… Kate took this literally in her second set of pregnancy photos. The first installment of her maternity photos were done fully dressed, in a natural light setting – take a peek back at that session here. For the second photo session, she came into the studio, showed more skin, and we used different lighting techniques to highlight her shape and the incredible poses she was able to achieve. Stay tuned tomorrow to see what came of this pregnancy… a beautiful baby boy. Think you’re ambitious? Well, meet Victoria… This stunning lady is not only cooking her first born, but doing so while in school for nursing, and serving in the Army National Guard! Makes me feel like a complete underachiever! Gabriella, Sharon and I all photographed her, and can’t wait until she comes back in with the baby, so we get to put him in all of her Army gear… Plus, my wheels are already turning for some stunning mom & baby newborn poses. What are you doing to my life?!? I once heard someone talk about what it must be like for a child when their parents tell them they’re going to have a new baby… It went something like this: Imagine you’re happily married, and your husband comes home and says “Honey, guess what?! I’ve gotten us another wife! I’m going to love her as much as I love you… Aren’t you excited? ?” No!!! The trepidation that little kids feel often comes through on their face, and I love to capture it! I once took a great shot of my niece’s face the second she walked into the hospital room to meet her new baby sister… right before she turned around and walked right out! Her face said “I don’t think so…!” Mr. Leo here had a similar feeling during his mom’s pregnancy photo shoot, and I think these pictures are the cutest! Good luck to his baby sister…! What could be better than a beautiful summer day, and a glowing couple expecting their first child? Put in the backdrop of Chagrin Falls, and not much!! I first met this adorable pair when I had the pleasure of photographing their engagement photos, and can’t wait until I get to continue documenting the stages of their lives when the baby comes! 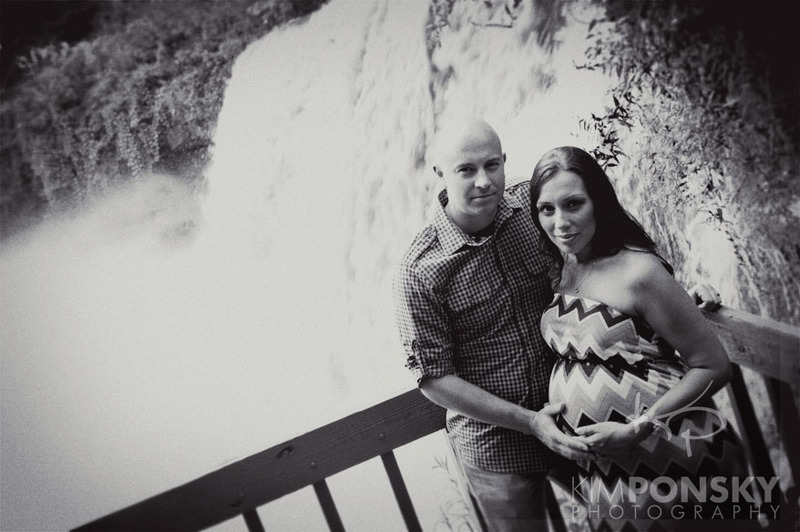 Here’s a glimpse of Monica and Matt’s recent pregnancy photo shoot.